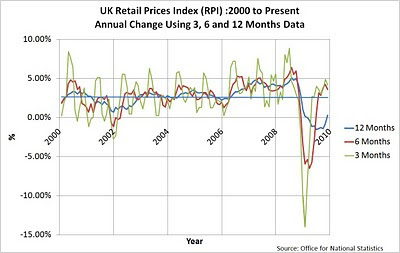 The Office for National Statistics (ONS) reports the November 2009 UK Consumer Price Index (CPI) as 1.9% and the UK Retail Price Index (RPI) as 0.3%. “The Bank’s monetary policy objective is to deliver price stability – low inflation – and, subject to that, to support the Government’s economic objectives including those for growth and employment. Price stability is defined by the Government’s inflation target of 2%.” The inflation measure they use is the CPI and so why would they raise interest rates? I however don’t like what I see when I look at the raw data and think inflation could quickly get out of hand given the very low interest rates and quantitative easing that is currently occurring. 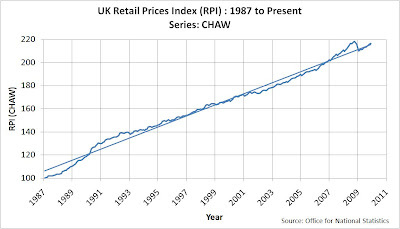 The first chart is tracking the CHAW Index which is the RPI including All Items. I focus on the RPI as my National Savings and Investments Index Linked Savings Certificates use the RPI to index from. This saw a big dip when the Bank of England dropped interest rates to historic lows however the chart shows that all the dip did was compensate for the big kick upwards that was seen from 2007. The current level of the Index is just about on the trendline suggesting we are back to the average annual increase since 1987 which is around3.5%. The second chart is again based on the CHAW Index. This chart shows annual figures based on the previous 3, 6 and 12 month’s worth of data. As of November the 12 month figure is 0.3% (as published by the ONS) however disturbingly the 6 month figure is 3.6% and the 3 month figure is 4.1%. It will be interesting to see the official January 2010 numbers which is 12 months from the low in the Index at January 2009 and whether the Bank of England does anything about it. My simple projections suggest this could be up to 3.7%. I’ll keep buying Index Linked Savings Certificates whenever possible if this is going to continue. This is an interesting blog, thanks for putting the effort in. I came here from GEI and am also in my thirties with a longer term view. Can't say I know too much about a stategy yet but it looks like your blog will help. Thanks for the support VB. I'm also learning a lot as I go and have already made some mistakes that cost me money. Please feel free to share as you learn or make comments/suggestions.